The C-TRAC Cooling Sequencer is a fully integrated Heating-Cooling control with Economizer, intended for use with packaged Direct Expansion cooling units, packaged air handlers with remote condensing units, or air handlers with chilled water and hot water coils. It is the highest level of the TRAC Family. 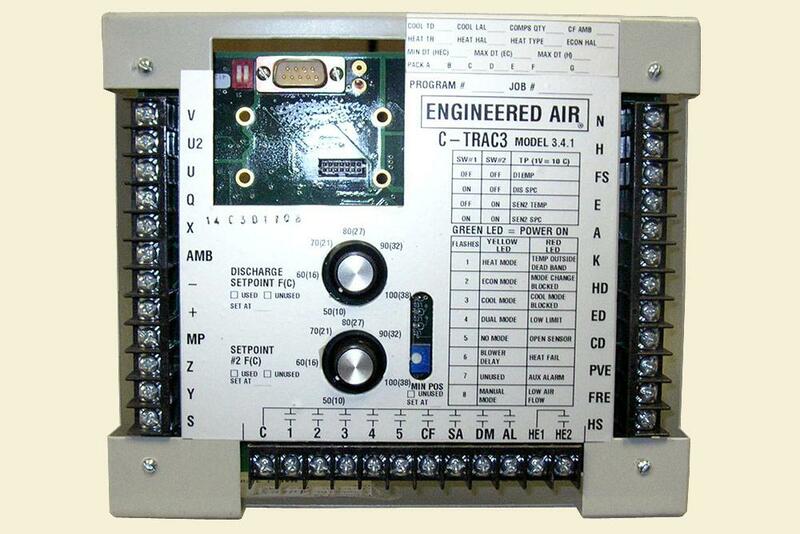 Other Engineered Air TRAC controllers can be slaved to the C-TRAC. 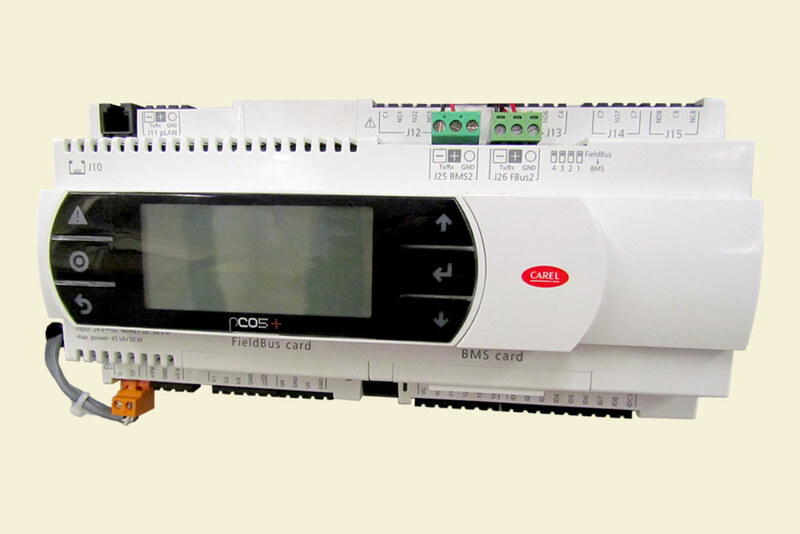 The slaved heating controller receives a 0-10VDC control signal from the C-TRAC. To eliminate electro-mechanical devices, (switches, relays, etc) by means of logic based programming. Minimum Compressor Run Time: 4 min. Minimum Compressor Off Time: 4 min. Minimum Interstage Time: 4 min. The G-TRAC Industrial Furnace controller has been designed to provide accurate proportional-integral control for indirect-fired burners with particular emphasis on allowing the burner to turn down to its full capability while maintaining acceptable flue-gas properties. The G-TRAC is unique among industrial gas-fired air heater controllers, in that the air-gas ratio is monitored throughout the entire turndown range, which, in the Engineered Air DG Industrial Heater, spans from full fire to 5% of full fire, or a turndown of 20:1. Together the DG high turndown burner and the G-TRAC controller provide optimum air heater performance. 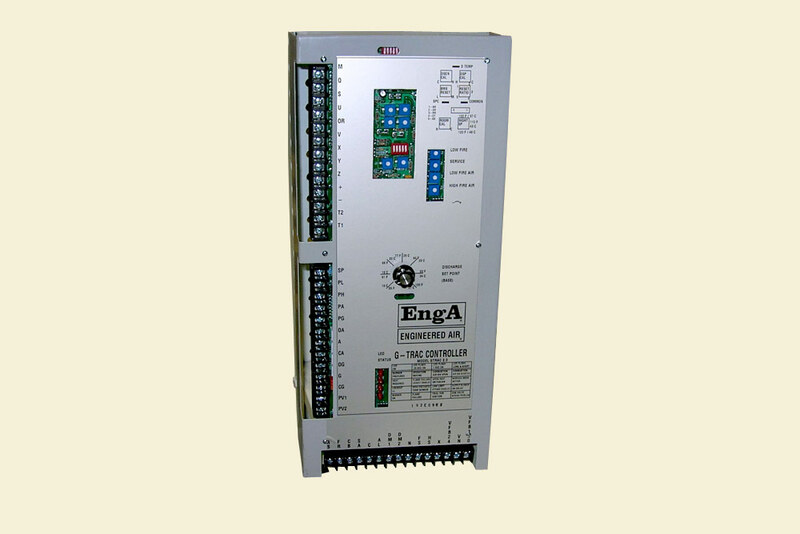 The G-TRAC is a stand-alone controller for the Engineered Air series DG Industrial Furnance. Alternatively it can be slaved from the C-TRAC Cooling Sequencer for integrated control of a packaged air conditioner, such as the Engineered Air FW-DG, or a split system using a DG heat section and a CU condensing unit. The Engineered Air DJ Series indirect fired burners offer superior turndown and modulates both gas firing rate and combustion air quantity. The DJM controller is a programmed logic device that provides proportional-integral control when used with any one of the DJ series burners. The basic function of the DJM is to control discharge air temperature. The discharge air setpoint can be set either at a fixed value, or can be reset from a number of options. The DJM in its various forms can operate as either a stand-alone controller, or it can be interfaced with our C-TRAC mechanical cooling controller. 4 LED's on face of panel. 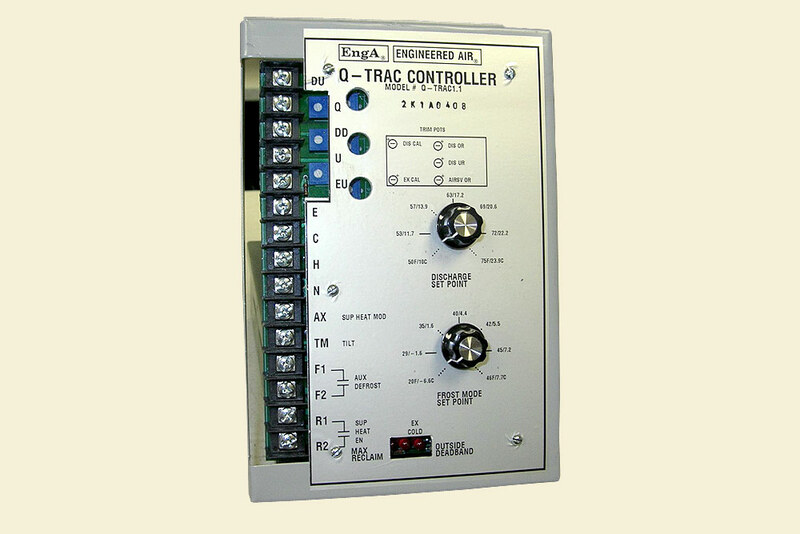 The H-TRAC controller has been designed to control staged electric heat applications. It utilizes a proportional-integral control stategy to sequence five binary style output stages. On indicates a stage is about to switch on or off. The rate of heat transfer in a QDT heat pipe is dependent not only on the size, number of rows and fins, but also on the mounting angle. The Q-TRAC controller is designed to operate the tilt mechanism on a QDT heat pipe to control tilt angle. Controlling the rate of heat transfer via tilt angle of the heat pipe has three objectives. Temperature control: supply air temperature leaving the heat pipe. Frost Prevention: maximizing heat transfer while preventing the formation of frost on the exhaust leaving side of the coil. Heating-Cooling changeover: by reversing the tilt angle, the direction of heat transfer is also reversed to allow summer operation. The Q-TRAC control is a stand alone solid state device that provides proportional-integral control for all three functions when mounted on a QDT heat pipe with tilt mechanism. 3 LED's on face of panel. The rate of heat transfer in an Engineered Air heat wheel is dependent on the rotation speed of the heat wheel. 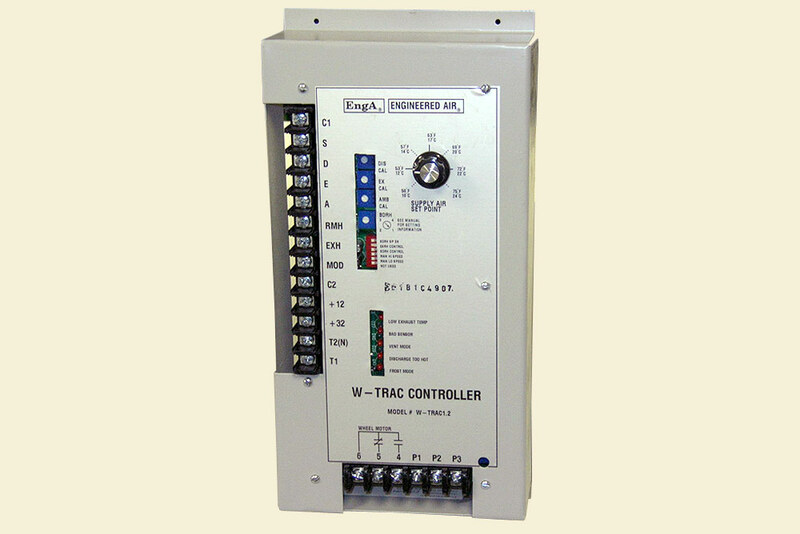 The W-TRAC controller is designed to provide variable speed control for an Engineered Air heat wheel. By controlling the rotational speed of the head wheel, and in turn controlling the rate of heat transfer, three functions can be accomplished. Control of supply air temperature leaving the head wheel. Prevention of frost formation on the exhaust side of the wheel while keeping heat transfer at the maximum allowable level. Heating-Cooling changeover. In heating mode heat is carried from the warm exhaust to the cold outside air. In cooling mode heat transfers from the warm outside air to the cooler exhaust air. The wheel simply rotates in either case and as such there is no difference in operation between heating and cooling. By stopping the wheel completely a free cooling mode can be provided. This is desirable if cooling is required and outside air is colder than the exhaust air. The W-TRAC controller is a stand alone solid state device that provides proportional / integral control for all three of the above functions when mounted with an Engineered Air wheel. When combined with a DC drive motor the W-TRAC can provide exceptional high turndown speed control. DC drive motors offer the advantage of high torque ability at very low speeds. The W-TRAC can also provide a 0-10 vdc control signal to a variable frequency drive if conditions require the use of an AC drive motor. 5 LED's on face of panel. The Engineered Air M-TRAC controller is designed to control Engineered Air HE Series direct fired burner on make up air units. M-TRAC controller is a programmed logic device that provides a stable PI (proportional + integral) temperature control and airflow monitoring system. A dual sensor option is built in the M-TRAC controller to provide an even discharge temperature. The M-TRAC controller has eliminated many mechanical parts such as air proving switch, damper end switch, timers and relays. The M-TRAC provides interlock between the exhaust fan and the make up air unit. This allows the M-TRAC to prove the operation of both the exhaust fan and supply fan. Reverse interlock is also available. This feature is designed for use in buildings which should not go into a negative pressure condition during start up mode. 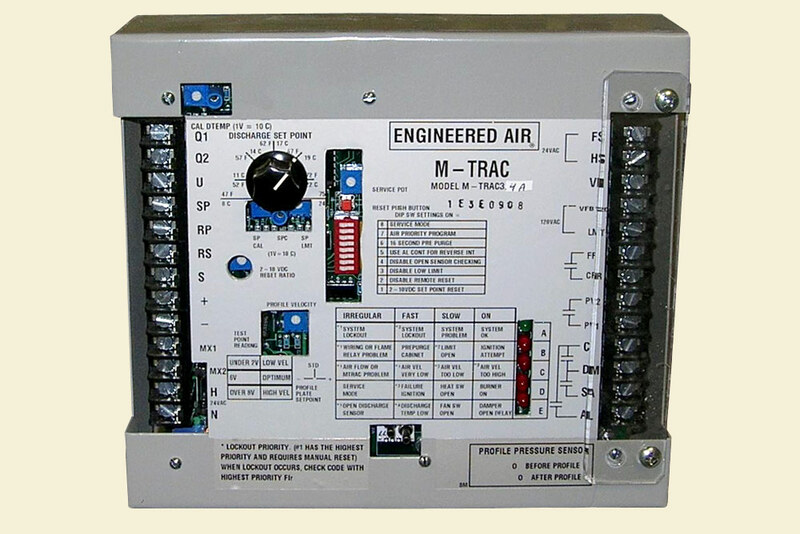 The Engineered Air M-TRAC controller is designed to be user friendly. The controller is equipped with five diagnostic LED lights. System status can be determined by the LED color and its flashing patterns. This features allows easier troubleshooting. The M-TRAC in its various forms can operate as either a stand-alone controller, or it can be interfaced to a higher level controller such as a C-TRAC or programmable controller. 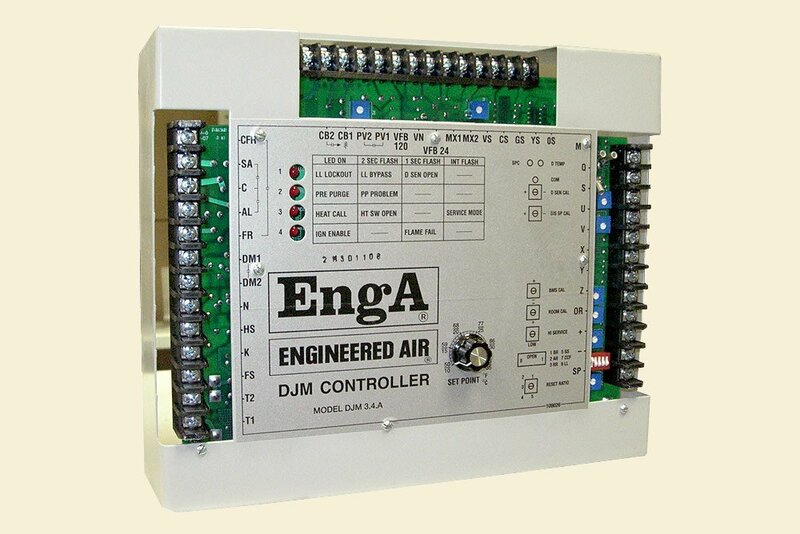 When used as a stand-alone device the controller provides most of the control requirements of a make up air unit. Standard abilities include: discharge temperature control, supply blower control, burner management, inlet damper control, auto bypass low limit, and air flow monitoring. The S-TRAC controller has been designed to control Engineered Air SH Series of gas fired humidifiers. It utilizes a proportional-integral control strategy to modulate humidity level. 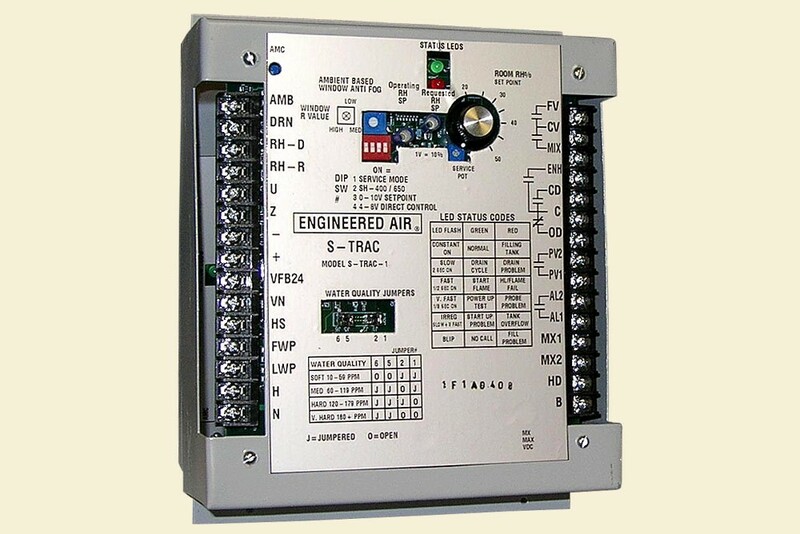 The Engineered Air S-TRAC controller is a programmed logic controller. It has eliminated many mechanical parts such as timers, relays and water level controller. The S-TRAC provides water level, burner, humidity and system status control. It also has a built in drain cycle timer. The S-TRAC controlled SH humidifier will initiate a drain cycle depending on the hardness of the water and the firing rates of the burner. A mixing valve is also incorporated in the S-TRAC to eliminate high drain temperature. The S-TRAC can be used in a variety of control applications. 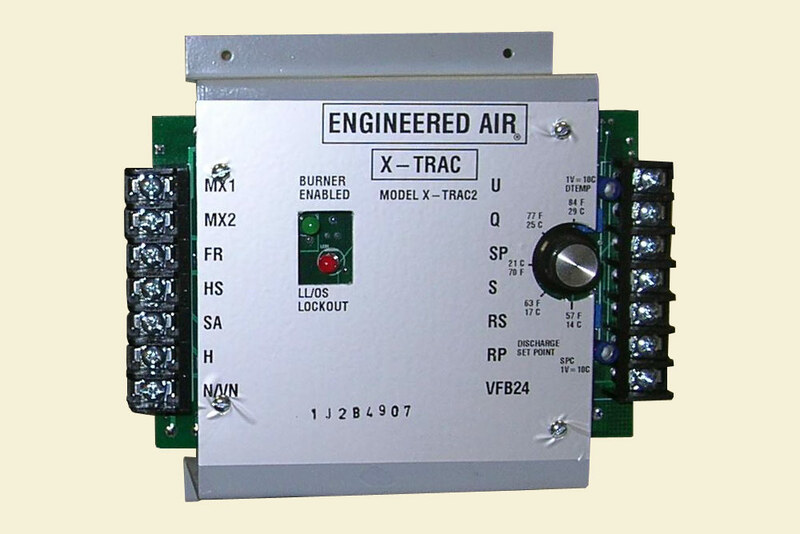 Engineered Air X-TRAC is a logic controller designed to control XE, RT, PACK and DJ(E)-20&40 with constant combustion air. The X-TRAC was designed to replace the Maxitrol controller, provide excellent temperature control, increase control flexibility, and provide safety features as provided by other TRAC controllers used for gas heat. The X-TRAC through the use of digital electronics, has eliminated many of the traditional control components resulting in fewer parts, simplified wiring diagrams and reduced wiring. The X-TRAC replaces the Maxitrol Series 21 amplifier & auto bypass low limit. The X-TRAC uses a control scheme incorporating Proportional and Integral control (PI) to maintain discharge temperature at set point. X-TRAC has built in non-recycling auto bypass low limit. It also has a self-check feature that ensures that the discharge sensor is operating within its tolerances. Two built-in status lights for heat call & lock out are provided.